Member GolfBC Group | Nicklaus North Golf Course and Table Nineteen Lakeside Eatery, along with sister Whistler property the Crystal Lodge and Suites, is owned and operated by Burrard International and GolfBC, a Vancouver-based golf and resort management and investment company defining a higher standard of quality and consistency among premier golf destinations. 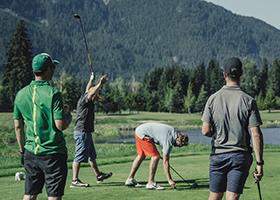 Since 1989, GolfBC has been creating premium golf destinations and master planned golf communities in British Columbia. Additional information about GolfBC can be found at its website: www.golfbc.com. VIEW OUR BROCHURE Sign up for THE INSIDER Nicklaus North eNews! Table Nineteen Lakeside Eatery: open daily during golf season, evenings during the winter mid-December to March.